Railpictures.ca - Graydon Johnston Photo: After having finished switching hoppers at Owen Illinois moments ago and adding the empties on to their train, CN 559 is now seen running its power around its train on the Glass Lead and as soon as they re-couple to the south end of their train, they will switch out box cars at Zocheam which is the second of the last two customers on this line (first one being Owen Illinois). The building on the right known as Royal Canadian Steel is one of the former rail customers on this line and the garage-like door is with no doubt where the rail cars entered the building back when they used rail. Time: 12:05 | Railpictures.ca – Canadian Railway Photography – photographie ferroviaire Canadienne. Caption: After having finished switching hoppers at Owen Illinois moments ago and adding the empties on to their train, CN 559 is now seen running its power around its train on the Glass Lead and as soon as they re-couple to the south end of their train, they will switch out box cars at Zocheam which is the second of the last two customers on this line (first one being Owen Illinois). 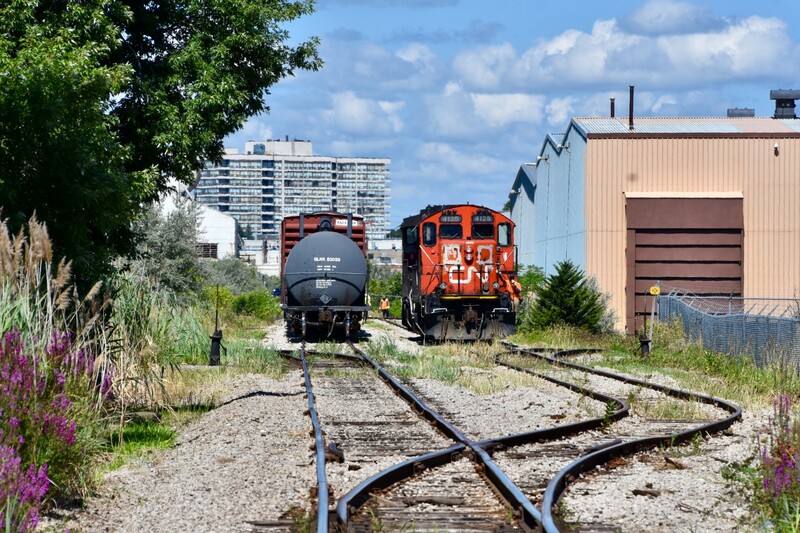 The building on the right known as Royal Canadian Steel is one of the former rail customers on this line and the garage-like door is with no doubt where the rail cars entered the building back when they used rail. it was called ‘The Wrong Guy’ set in Illinois released in 1997 with Dave Foley of Kids In The Hall fame. The GP9m is 4138 and the logo appears to ‘AR’ with Illinois written underneath it. Thanks Brad, what film were you referring to? Nice one Graydon. The good ol ‘patch job’ GP9rm…looks like my modelling efforts before sanded and touched up with paint! And just as unique as the one with the ‘freelance’ rail logo on the front used for the film.